An investment management company goes wide-open in their brand new space. Image courtesy of Woodhouse Workspace. 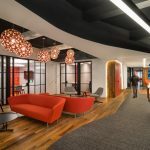 When Ruffer LLP, a London-based investment management company, hired Woodhouse Workspace to refurbish its expanding offices, the company asked for a collaborative space. Woodhouse responded with demolition — stripping out existing ceilings, floorings, and partitioning — and replacing them with bright white walls, lots of glass, walnut doors, bright textiles, fine-tuned acoustics, and state-of-the-art audio-visual equipment. But the best part of the new offices? Sophisticated kitchenettes — which the Brits call teapoints — complete with bespoke booths and benches that lead out to a remastered terrace. Located steps from shops, restaurants, and cafes, Ruffer is also just a five-minute walk to Victoria train and bus station. Connection, Orangebox, and Frovi, among others. Please touch upon any notable products, how they were used, and if they solved a specific problem. We utilized the “Away from the Desk” range by Orangebox within some of the meeting rooms. They have an excellent table with an upholstered panel at one end holding a 32-inch screen, which is a very good collaboration tool. They’re mostly office-based, as there is a lot of team collaboration and strict confidentiality rules due to the nature of the service they provide. All the desking is assigned, however, there is a large number of meeting rooms and collaboration spaces, as well as a large breakout/teapoint space adjoining a roof terrace with outdoor furniture. There isn’t much by way of direct company branding throughout the space, however, the look and feel is all in keeping with their brand values. For the firm, the most unique part of the project is the teapoint/breakout space, which opens onto the roof terrace. This is a luxury that they love and use heavily. The hardest part of the project was aligning the aspirations of the leaders with what fits with the culture and demographics of the team.